Editor’s note: today’s caption is the answer to the October puzzler. The Aral Sea and Lake Balkhash have a lot in common. Both lakes are located in an arid part of Central Asia; both are somewhat saline; and neither has an outlet. But after the desiccation of the Aral Sea—once the fourth-largest lake in the world—Balkhash now covers a comparatively larger area. Spanning 17,000 square kilometers in Kazakhstan, Lake Balkhash is the largest lake in Central Asia and fifteenth-largest in the world. 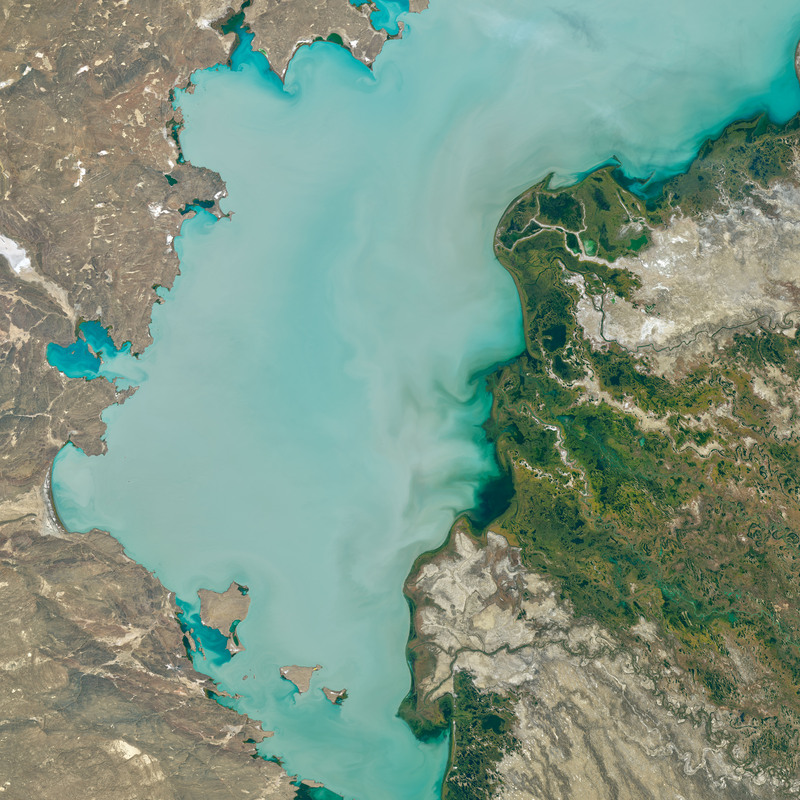 The Operational Land Imager (OLI) on Landsat 8 captured this natural-color image of Lake Balkhash on October 9, 2017. The image shows the southwestern part of the lake. Water in the western part of the lake is almost fresh—suitable for drinking and industrial uses—whereas the eastern side of the basin is brackish to salty. The western side is also murkier; visibility/light penetrates to about 1 meter, compared to more than 5 meters on the eastern side. This murkiness, and the water’s milky, yellow-green color, is likely due to sediments suspended in the water. “The lake is very shallow, and it is windy nearly every day, so waves can stir up sediments from the bottom,” said Niels Thevs of the University of Greifswald (Germany) and the Central Asia office of the World Agroforestry Center. Anywhere between 70 to 80 percent of the lake’s water comes from the Ili River, which enters the lake along the eastern shoreline. The surrounding delta (green) is now one of the largest wetlands in Central Asia. “I imagine that the wetlands of the Ili Delta look like the wetlands around Aral Sea 50 years ago,” Thevs said. Thevs describes large parts of the Ili Delta that are only accessible by boat, where you can cruise for hours amid 3-meter-high reeds. These reeds (Pharagmites australis) are considered invasive in the United States. Not so in the Ili Delta, where the plant is an important part of the ecosystem. Thevs also describes parts of the delta where the water is so crystal clear that you can see fish and water plants up to 7 to 8 meters below. If you were to cruise in a boat in the main part of the lake, you could count 43 islands with a total area of 66 square kilometers, according to Zhanna Tilekova of Kazakh National Technical University, who has published research on the region’s geoecology. However, those numbers can change. Tilekova noted that as water levels decline, new islands form and the area of existing islands grows. In the western part of the lake, Tasaral (north of this image) and Basaral islands are the largest. 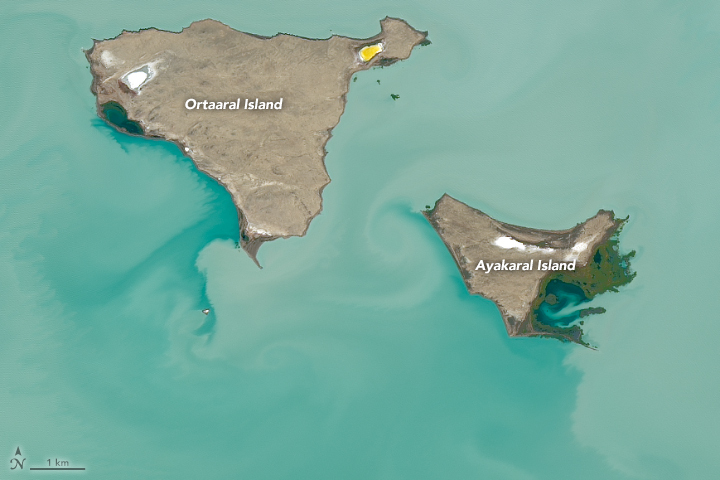 Ortaaral and Ayakaral islands are also relatively large (see the detailed image). Vegetation, likely small brown shrubs (Saxaul), can grow on these islands. The white areas are likely salt pans. 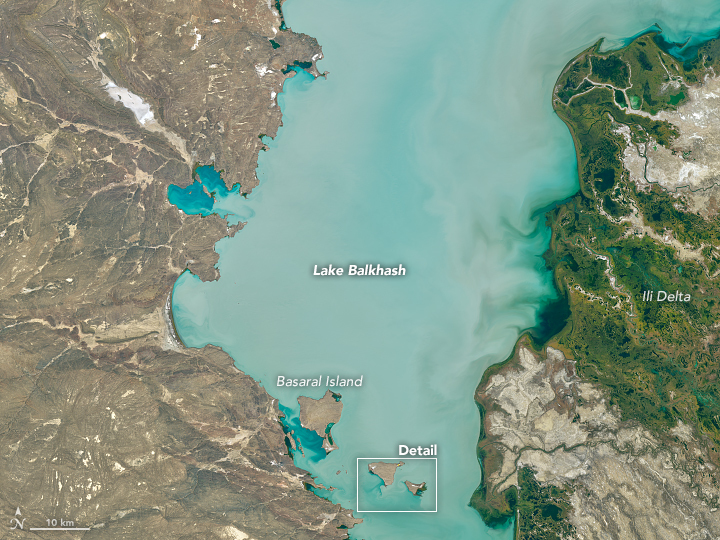 Aubekerov, B. et al., Complex Analysis of the Development of Lake Balkhash During The Last 2000 Years. Imentai, A. et al. (2015) Vegetation, fauna, and biodiversity of the Ile Delta and southern Lake Balkhash — A review. Journal of Great Lakes Research , 41 (3), 688-696. Kezer, K. and Matsuyama, H. (2006) Decrease of river runoff in the Lake Balkhash basin in Central Asia. Hydrological Processes , 20 (6), 1407-1423. Mother Nature Network (2017, November 3) 13 of the most bizarre lakes in the world. Accessed November 3, 2017. Petr, T. (1992) Lake Balkhash, Kazakhstan. International Journal of Salt Lake Research , 1 (1), 21-46. Tilekova, Z.T. et al. (2017) Assessing the geoecological state of ecosystems in the Balkhash region. Geography and Natural Resources , 37 (1), 79-86.